Hydroelectric power (hydropower) accounts for approximately five percent of the electric power generation in North Dakota and is generated by the Garrison Dam and Power Plant. Garrison Dam during the 2011 flood. Photo courtesy of Basin Electric Power Cooperative. Located approximately 75 miles north of Bismarck on the Missouri River, the Garrison Dam and adjoining Lake Sakakawea are an integral part of the landscape of western North Dakota. The Garrison Dam was constructed in the late 1940’s and early 1950’s and is the fifth largest earth dam in the world. Garrison Dam and Power Plant utilizes five turbines rated at a total capacity of 583 megawatts and generates between 1.8 and 2.6 billion kilowatt-hours of electricity each year. 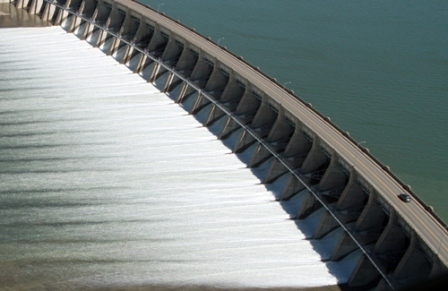 The Garrison Dam produces, on average, 1.76 billion kilowatt-hours of electricity annually. In 2011, due to additional water release from flooding of the Missouri River, the dam’s generators produced 2.6 billion kilowatt-hours. Nationwide there are 75 Corps hydroelectric power plants with a total capacity of 20,474 megawatts, nearly a third of total hydropower produced in the United States. The electricity generated by the Garrison Dam and Power Plant is marketed through the Western Area Power Administration (WAPA). Much of the electrical power generated at Garrison Dam is marketed to customers outside North Dakota, including customers in the states of Minnesota, Iowa and Nebraska. WAPA is one of four power-marketing administrations within the US Department of Energy whose role is to market and transmit electricity from multi-use water projects.